This issue of e-ReefNews features closeup pictures showing the amazing color of these two Caribbean fishes. 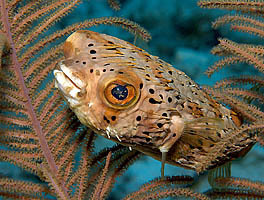 The black spots and long spines of this fish identify it as a Balloonfish. Click here to learn how Jonathan Dowell took this spectacular closeup picture. 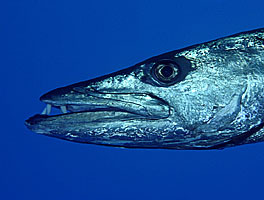 The Great Barracuda looks ferocious, so it is fun to get close to this big predator to get a great closeup like this one. Click here to learn how this big fish was just hanging out watching the divers. ReefNews is throwing a party! To raise money for this website, ReefNews is hosting the Atwater-Donnelly Celtic/Appalachian Folk Band for two concerts in September and October. Please visit these links to read about these benefit concerts in Los Alamos and Santa Fe, New Mexico. Atwater-Donnelly in Los Alamos Thursday Night, September 29. Atwater-Donnelly in Santa Fe Saturday Afternoon, October 1.